One of my favorite things about having house guests (other than their fabulous company, of course) is the opportunity to make something special for breakfast. Sure, we make muffins, scones, waffles, or cinnamon rolls on occasion for ourselves but the majority of the time it’s more oatmeal, granola, etc. When I have company though, I try to make sure they get something a bit better than the usual fare to start their day out right. And then, as an added bonus, we get to enjoy a special treat as well. 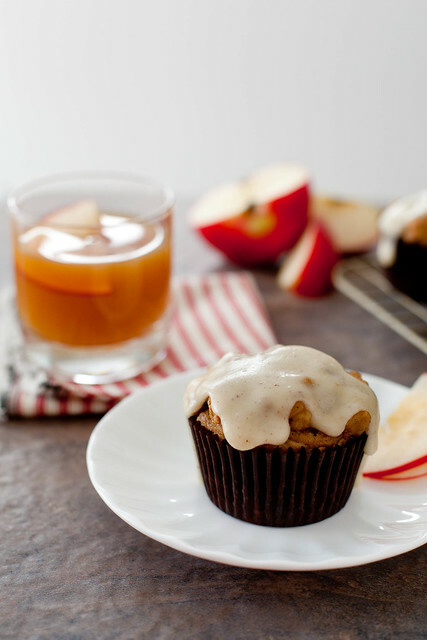 So these…these are loaded apple cider muffins. 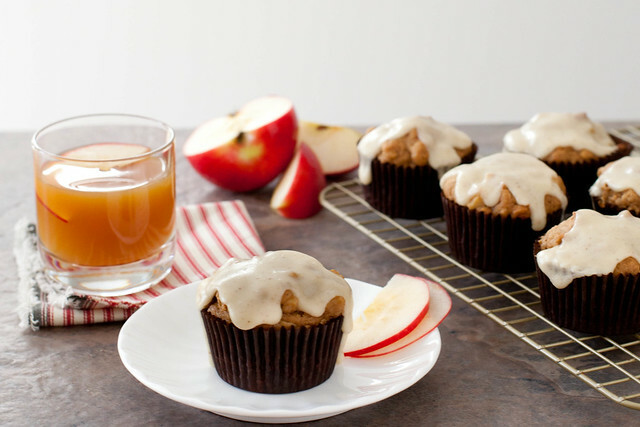 The muffin portion uses whole wheat pastry flour, chunks of apples, oats, and a modest amount of fat so they are on the healthy side, but they still taste good enough to eat on their own. Definitely the best apple muffin I have ever had. But then…oh my goodness…there is this browned butter glaze, which is incredible. Once you’ve tried them that way, there’s really no going back. I made these over the weekend with every intention of freezing some to have ready for our overnight Thanksgiving guests, but we loved them so much, they didn’t survive more than a few days. I think I know what Andrew and I will be baking this evening! I hope you all have a wonderful holiday giving thanks and spending time with your loved ones. Make sure you hold them tight. Heat the butter in a small skillet over medium heat. Let melt and continue to cook, swirling occasionally, until the butter is a deep golden brown color (be careful not to burn it). Set aside to cool slightly. Preheat the oven to 350˚ F. Line muffin pans with paper liners. Add the diced apples to a medium skillet over medium heat. Add 3 tablespoons of the apple cider, ¼ teaspoon of the cinnamon, and the nutmeg. Cook, stirring occasionally, until the apples are somewhat softened, about 8-10 minutes. Remove from the heat. Meanwhile in a small bowl, combine the flour, oats, baking soda, baking powder, remaining ½ teaspoon cinnamon, allspice and salt. In a second medium bowl, combine the egg, brown sugar, vanilla, applesauce, remaining 1/3 cup apple cider, and the cooled browned butter. Whisk to blend. Add the dry ingredients to the wet ingredients and whisk just until evenly incorporated, being careful not to overmix. Fold in the diced apples. Divide the batter between the prepared muffin cups, filling each about 2/3 full. Bake about 15-18 minutes, rotating the pans halfway through baking, until the tops are golden and set. When cool enough to handle, transfer to a wire rack. To make the glaze, heat the butter in a small skillet over medium heat. Let melt and continue to cook, swirling occasionally, until the butter is a deep golden brown color (be careful not to burn it). Set aside to cool slightly. Transfer the browned butter to a bowl and whisk in the confectioners’ sugar. Whisk in the apple cider until the mixture is smooth. (Note: If the browned butter begins to cool, particularly if the apple cider is cold when added, the glaze may become very thick or difficult to whisk. Simply rewarm in the microwave in very short few-second bursts until the texture has corrected. If the mixture is too thin, whisk in additional confectioners’ sugar a small amount at a time until thickened to your liking.) Spoon the glaze over the muffins and let set before serving.